Yesterday I visited Wurzburg, Germany for the first time. A really pretty, little old German town. Slightly reminiscent of Prague actually! I really liked the city. Quaint, romantic, old, cobblestone paths, charming. Love this bridge! Like the Charles Bridge in Prague. One of the walkways leading into the Market Square in Wurzburg. After crossing the bridge...heading into the old town part of the city. I know its blurry but the bridge was so cool at night. The Marienberg Fortress, on the right perched on top of the hill. View of Wurzburg from above. Tomorrow will be my last day with Gabriel, Theodore and Constance which actually has me feeling quite sad. I have really come to love spending time with them. They brighten my day and make me smile. I find it relaxing to just sit with them on the couch and watch a movie. Especially when one of them leans their head on my shoulder, really sweet. It touches my heart every time Gabriel tells me how sad he is about me not being able to watch them anymore, or makes me promise to visit, or asks about my day, or tells me that he misses me in the evenings when I am gone. Theodore has begun to listen to me more. Instead of reacting to things angrily and becoming a whirling dervish (spelling?) like he tended to in the beginning (he is a bit moody and temperamental), now when I tell him to take it down a notch, he looks at me quietly for a moment and then he often does. I love when Constance runs to my side by the oven and asks in her cute, tiny voice "Brooke, can I cook with you please?" It melts my heart. I have gotten Gabriel and Theodore addicted to Mille Bornes so we play that every single afternoon, at least 2-3 hands together. Really sweet. I have also begun to play a game with Constance called "tightrope walker" which involves me spinning her around and then setting her down. Then she and I both (since we are both dizzy from spinning) have to walk a narrow tightrope-like band on the carpet without slipping. This usually results in lots of giggling from her. Last week, Constance and I also had fun doing the "I like to move it" Just Dance video together via YouTube. That was really great. I also love listening to them talk to one another, or to their father in frequent French (it sounds so lovely and sweet, hearing little children speak that particular language, really lyrical and nice sounding), and then turn and speak to me in fluent, perfect English. I think that is so incredibly neat and inspiring. It fascinates me. They are so young! Especially when Constance does it, wow. 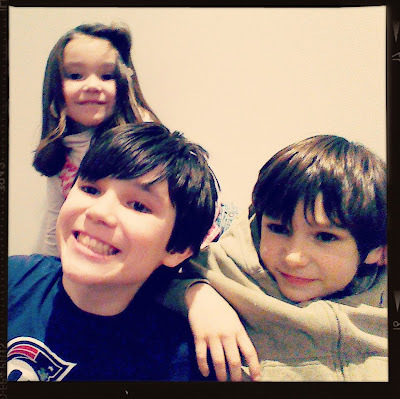 Below is a cute photo they let me take of them :-) Gabriel is on the bottom left, Theodore is on the bottom right and Constance is obviously on the top. Ciao for now, I am off! Rest of the weekend....and upcoming travels!!! The weekend was a success! A great one for sure. On Friday evening, I went out with a new potential friend, Rachel. I met her while interviewing at a nursery and we exchanged phone numbers. She is from Canada, young, sweet and fun to spend time with. She took me to an Australian bar which was great fun, I loved it. The bar was bright, rowdy, had a lively and fun energy and was packed with people. We ate nachos, sat, chatted and had a great time. I really enjoyed spending time with her. On Saturday, Christian and I went Christmas shopping in Darmstadt for his family (stopping for some KFC/Pizza Hut to go on the way, his favorite haha), and then I hopped on a bus to the main train station to go into Frankfurt. I met my friend, Sally at the Opera House at 7:30pm for the Vienna Boys Choir concert which I had been counting down excitedly for since we bought our tickets the day before. We sat down in our seats and chatted for 20 minutes while waiting for the show to start. Finally the boys filed out onto the stage. The stage was bare. Just a rise for a few of them to stand on, a grand piano in the middle and that was it. There were 22 boys in all, dressed in navy pants, white shirts with navy trim. The boys appeared to range in age from 6-11. Some were so tiny! I leaned over and whispered to Sally "Oh man, if they sing Carol of the Bells at some point, I would die. Also God Rest Ye Merry Gentleman is good too." Their voices were hands down the most beautiful I have ever heard live. Whoa. When they opened their mouths and began to sing, it gave me chills. They were pure, clear, strong, almost heavenly sounding, incredible. I was riveted and loved every moment of it. And guess what their second to last song was?!?!? I felt a shiver go up my spine as they began singing it. http://www.youtube.com/watch?v=6xO_53m7foE in fact, here is a clip of the Vienna Boys Choir singing it. (They begin singing around 1 minute, 20 seconds in). I think my heart actually skipped a beat when they began the lead in to the song, good god. This is my FAVORITE Christmas carol ever <3 it has been for years and years. I think its absolutely magical, beautiful and just awesome. (When the Vienna Boys sang during the concert I saw, there wasn't the long musical lead in that this version gives. But the singing, thats exactly what their voices sounded like live). http://www.youtube.com/watch?v=YVGKfDoANRA Another awesome version of Carol of the Bells, though this isnt the Vienna Boys Choir (but they sounded quite like this. Their voices had this stunning purity and beauty, even live. I was shocked). I think this version is especially magical. They also sang God Rest Ye Merry Gentlemen which was lovely along many other gorgeous songs. Here is a clip I found of them singing this carol: http://www.youtube.com/watch?v=9Ehamuf1eVk (of course, this isn't the exact show I saw, but it is them singing it). Anyway that aside, absolutely loved this as you can all tell. And it was only 20 euro for a ticket! Awesome. Really, really sweet. He made me reassure him that I would visit them sometimes and we could still keep in touch, asking me how often I would come and such. Very cute. I have grown to really love spending time with them. I have been surprised that time with them has become one of the best cures for when I feel lonely, to be honest. For some reason, I really love going over there now. The world-famous Vienna Boys Choir. I am seeing them LIVE tonight!!! 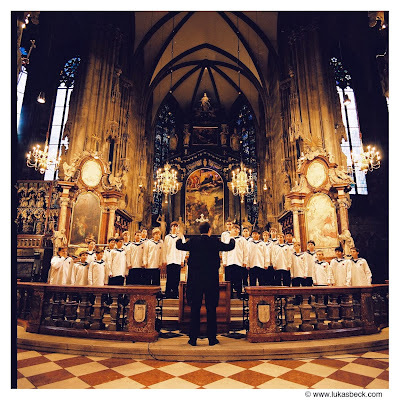 The Vienna Boys have been singing at the court of the Holy Roman Emperor since the early 15th century. In 1498, more than half a millennium ago, Emperor Maximilian I moved his court and his court musicians to Vienna. He gave instructions that there were to be six singing boys among his musicians. Historians have settled on 1498 as the foundation date of the Vienna Hofmusikkapelle and in consequence the Vienna Boys Choir. Until 1918, the choir sang exclusively for the imperial court, at mass, at private concerts and functions, and on state occasions. Musicians like Heinrich Isaac, Heinrich Ignaz Franz Biber, Johann Joseph Fux, Wolfgang Amadeus Mozart, Antonio Caldara, Antonio Salieri and Anton Bruckner worked with the choir. Composers Jacobus Gallus and Franz Schubert were themselves choristers. Brothers Joseph and Michael Haydn, members of the choir of St. Stephen’s Cathedral, and frequently sang with the imperial boys’ choir. In 1918, after the breakdown of the Habsburg Empire, the Austrian government took over the court opera, its orchestra and the adult singers, but not the boys’ choir. The Vienna Boys Choir owes its survival to the initiative of Josef Schnitt, who became Dean of the Imperial Chapel in 1921. Schnitt established the boys’ choir as a private institution. The former court choir boys became the Wiener Sängerknaben (Vienna Boys Choir), the imperial uniform was replaced by the sailor suit, then the height of boys’ fashion. Funding was not enough to pay for the boys’ upkeep, and in 1926 the choir started to give concerts outside of the chapel, performing motets, secular works, and - at the boys’ request – children’s operas. The impact was amazing: Within a year, the choir performed in Berlin (where Erich Kleiber conducted them), Prague and Zurich. Athens and Riga (1928) followed, then Spain, France, Denmark, Norway and Sweden (1929), the United States (1932), Australia (1934) and South America (1936). Today there are around 100 choristers between the ages of ten and fourteen, divided into four touring choirs. The four choirs give around 300 concerts and performances each year in front of almost half a million people. Each group spends nine to eleven weeks of the school year on tour. They visit virtually all European countries, and they are frequent guests in Asia, Australia and the Americas. 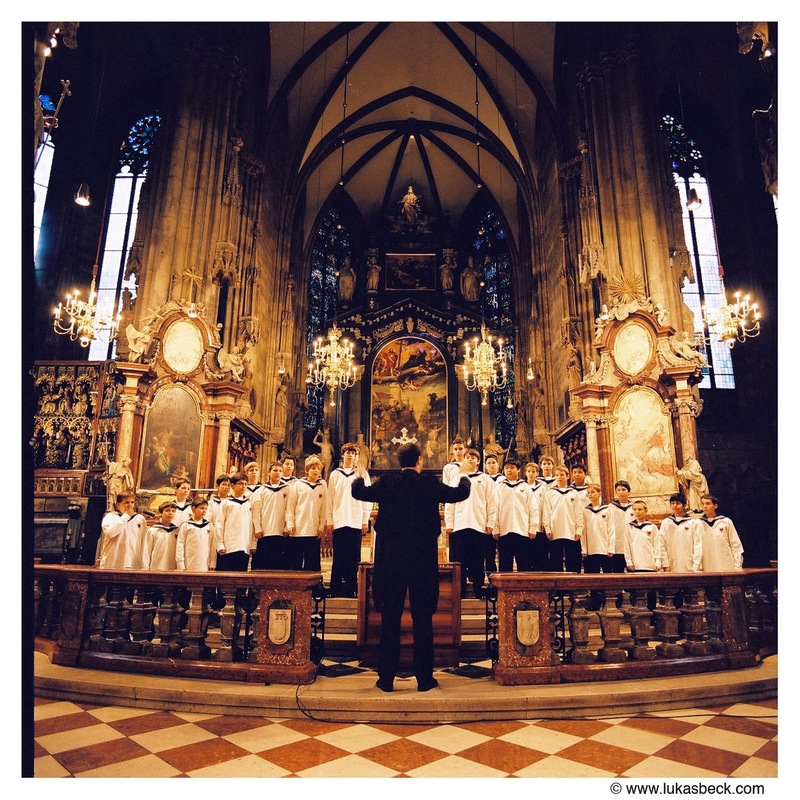 Together with members of the Vienna Philharmonic Orchestra and the Vienna State Opera Chorus, the Vienna Boys Choir maintains the tradition of the imperial musicians: as Hofmusikkapelle they provide the music for the Sunday Mass in Vienna’s Imperial Chapel, as they have done since 1498. On 1 January 2012, the choir participated for the fifth time in the New Year’s Concert of the Vienna Philharmonic Orchestra, conducted by Mariss Jansons. I highly recommend listening to a few of their carols, such as O Holy Night, God Rest Ye Merry Gentlemen or We Three Kings. Anyway so how did this come about, I am sure you are wondering. Today (Friday) I was meeting with Sally, the English woman with whom I have become friends with for tea. We had great conversation and lots of laughs. We talked about relationships, books, music and other fun life stories. Then she told me, "Oh my gosh, Brooke!!! I have something really important to tell you that I almost forgot! I was looking in the booklet the other day for the Alte Oper (the opera house in Frankfurt) at the upcoming shows and was shocked to see the Vienna Boys Choir is playing there tomorrow night!!! I remember you mentioning how much you would love to see them live sometime in Vienna. I bet if we drink our tea fast and head over there now, we could see if they still have tickets. If you would like to, I would walk over there with you." We took the subway over and surprisingly, they still had some tickets left!!! And some for only 20 euro each (up on the balcony but still with a decent view and one can hear up there perfectly, she told me). Sally turned to me and asked, shall we?? I said, yes!!! Lets do it. I would LOVE that! Gabriel, the 11 year old French boy who I babysit (along with his two siblings) said to me yesterday evening before I left, "Brooke, I asked my Mom the other day how she found the best babysitter. I really don't know how she did it. How she found the perfect babysitter. You are really nice, and just really great with us. I don't think there are other babysitters out there like you." This makes me think of NYC!!! So that is the big, incredibly awesome news I have to share. Yes, literally the day before my visa was set to expire, I was offered a job. Talk about being down to the wire!! And to be exact, I had two job offers! One was at a small bilingual nursery (Spanish-English). Only three other teachers worked there and around 12 kids attended. The age group was around 1-2 years of age. I really liked this nursery. I liked the small team, it had a cozy, intimate feeling to it, and I liked the location. However they offered me only 20 hours per week and not great pay (since the amount of taxes that is taken out of paychecks here in Germany is like a bomb to one's income). Then the very next day, I was offered a job at the other school where I had an interview. This school is much larger, around 40 teachers I believe. Each class is around 15 children and the ages range from 1 year olds in the nursery to 6 year olds in the preschool classes. This school felt a little bit larger to me, a little less personal and a bit colder. But I much prefer this age range of children. It will not just be changing dirty diapers and chasing crawling toddlers around. Instead, at this school, I can actually interact with the children. I accepted the job at the second school! The pay is actually quite good, more then I thought I would be getting, so that was a superb surprise. I will be working 40 hours per week, Monday through Friday, 8am-4:30pm regularly, however two evenings per week we have to work a "late shift" which will either end at: 5pm, 5:30pm or 7pm, depending on which late shift we get. We also receive 27 days of vacation per year. Insane. That would be unheard of starting out a new job in the US, yet that is the standard over here (like the two weeks we get back in the US). Therefore, I am feeling pretty relieved and psyched about all of this!!! I will be working alongside another female teacher. She and I will be a team unit within this one classroom together, the same classroom every day of 5/6 year olds. She is the German teacher and I am the English teacher. The day is filled with a variety of activities, from a dance lesson, to free play, breakfast, lunch, recess, quiet time, the kids receive a German lesson (which my co-teacher will give) and then they will receive an English lesson (which I will be responsible for giving, on any topic of my choice). That is basically the gist of it! I am set to start my new job on Monday, December 16 (assuming my work permit is cleared by then)!!! I will work that week, then I get two weeks off and will resume in the first week of January to start work regularly. In other news, this past Tuesday evening was Christian's 27th birthday. His family asked me to somehow get him to Darmstadt (the town that is about 20 minutes from his home in Reinheim) so we could meet as a surprise at the Christmas markets. 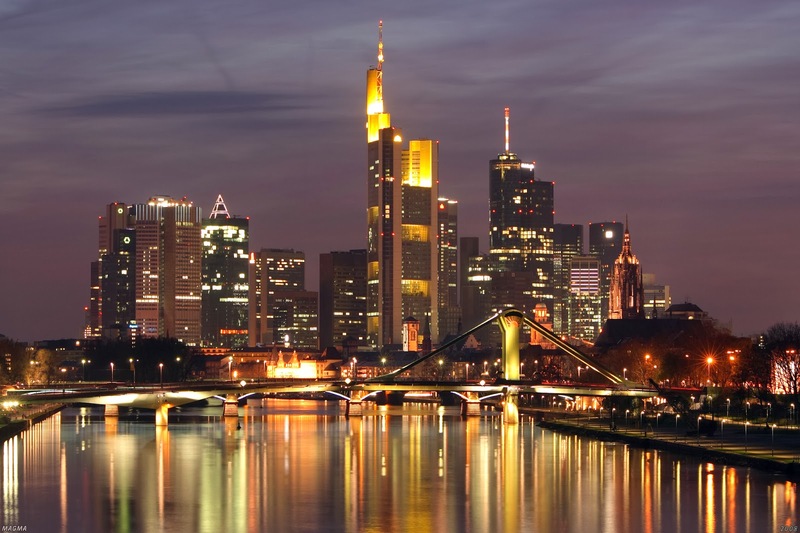 Germany is known for their Christmas Markets. They are supposed to be the best in the world actually. During the month of December, there are Christmas markets set up in the main squares of towns all throughout Germany. Therefore, I used my best convincing skills ;-) and got Christian to come meet me at 7pm after we both got out of work that evening in the main square within Darmstadt. His family arrived early. So I stood around little tables underneath the awnings of a drink stall with all of them, chatting and laughing. It was me, his mother, his father, his brother and his sister (his sister I was meeting for the first time this evening!). As Christian walked up, he had the biggest smile on his face which then turned into giggles as he approached us looking so happy. Glühwein (roughly, "glow-wine," from the hot irons once used for mulling) is popular in German-speaking countries and in the region of Alsace in France. It is a traditional beverage that is offered during the Christmas holidays. The oldest documented Glühwein tankard is attributed to Count John IV ofKatzenelnbogen, a German nobleman who was the first grower of Riesling grapes. This gold-plated lockable silver tankard is dated to c. 1420. Glühwein is usually prepared from red wine, heated and spiced with cinnamon sticks, cloves, star aniseed, citrus, sugar and at times vanilla pods. It is sometimes drunk mit Schuss (with a shot), which means that rum or some other liquor has been added. Fruit wines, such as blueberry wine and cherry wine, are occasionally used instead of grape wine in some parts of Germany. There is also a variation of Glühwein which is made with white wine. However, white Glühwein is less popular than its red counterpart). We enjoyed spicy sausages (yes I tried a bite, despite that I do not generally like sausage, and it was pretty good actually), we walked inside the mall for some warmth briefly where we bought lottery tickets (Christian loves these) and gave him a few gifts. It was really fun. I really enjoyed watching him with his brother and sister. Lots of smiles, poking fun and giggles were exchanged. And I liked seeing the five of them together, just him with his parents and siblings. I felt blessed to be able to be there for this intimate celebration with him and his family. I really loved it. On Friday, November 29 of this past weekend, I met a new potential friend in Frankfurt after work. I met him through the German-English conversation group I have been attending on Tuesday nights. He is from Prague actually and moved here as his girlfriend lives in Germany. He and I drank some Gluhwein and then walked around the Christmas market in Frankfurt. We chatted about the feeling of living in a new city and not really having anyone yet (how that's a bit tough), we talked about our respective love of Harry Potter, our hobbies, etc. It was a lot of fun. I enjoyed hanging out with him and will hopefully do it again! And now, as the last part of today's blog entry; I would like to post this fun article I found online about what the experience of living abroad can be like. I like it a lot. I have found much of it to be true thus far. Except I personally have not let go of any of my personal friendships or other relationships back home. Because the difference is, this move is temporary for me. I will be returning :-) and want to continue those relationships in the meantime so we can pick up where we left off when I return. Moving around the world teaches you many things. It isn’t for everyone. It takes a special type of person to be able to do what we do. Packing up all your things into two (or five ;-)) carry-on bags and two checked pieces of luggage is struggles in itself, and to generalize, imagine being a woman! I could only bring 10 pairs of shoes! Your mother will go through that luggage and make you narrow it down to seven cardigans instead of 17 and she will remind you that those shorts still don’t fit and haven’t fit for 3 years, so you should probably just let them go. Along with letting those shorts go, you are also letting go of friendships, relationships, comfort. 1. Freedom. A new sense of freedom. Freedom to do and go as I please. Freedom to travel. Freedom to make choices without a safety net. Freedom to be yourself. 2. Watching your life at home pass by. Birthdays come and go. Marriages. Deaths. Life doesn't stop and wait for you. 3. Math skills strengthen as you are always trying to convert your local currency to your home country. You know it is even better when you convert your new currency to your previous country. Everything is still in pesos for me. 4. Communication. Responding to someone in any language but the language they are speaking. 5. Stories. The stories you will have to tell for the rest of your life are so unbelievable most people will think you are exaggerating. Hospitals. Airports. Dentists. You try getting your point across in any means possible. And do I mean ANY means possible. 6. You realize little holidays and moments you didn’t think mattered are the ones that make you the most homesick. 7. Growth. As much as you hate to admit it with each move you grow. You learn the best ways to pack, meet new friends, get around, and survive. 8. Adrenaline. Those thrill seekers jumping off canyons and out of airplanes have nothing compared to boarding a plane and traveling to an unknown place. Not knowing anyone. Not knowing your surroundings. Not knowing the language. Now that is a real adrenaline rush. 9. Patience. Realizing no one understands you. No one cares. Ordering food, getting in a taxi and normal every day tasks take patience. Nothing is ever easy. A 10-minute task at home will take you 60 minutes. Accept it. 10. Having to say hello for the first time and having to say goodbye for the final time. Not many people get to experience this. This could quite possibly be the hardest and most dreaded part of my life. Start slow, go to a new place. Alone. Go to a city by yourself. Go on a vacation, alone. Throw yourself out there. Your own sink or swim. When you begin to panic and want to go home, that is when your fight or flight will kick in. That true inner strength will shine through. You will fight it out and you will thank yourself later. I know I did.